Wow! The last few weeks have been cuh-razy. We moved over Memorial Day weekend, and as a wonderful surprise, Grandpa Tyler came to visit. (He actually came to see uncle Harry because he wasn't doing so well, but he has since recovered.) He was kind enough to help us with our move and to spend lots of time with Asher and Ruthie so that we could get things done. We also had a lot of help from some of our friends from church, so we were able to get everything moved out of the old house and into the new house in only 1/2 of a day! Which brings up another fun thing - Adrienne came to visit last weekend! We had so much fun. It was the perfect trip - Kelly played tour guide and took Adi around to see the sights, and we joined in when we could. I felt bad that most of our house was still filled with boxes for Adi's visit, but I was grateful that we had a guest room and guest bed for her and Kelly to stay in. We will add more pictures in our next posting, when the house is a bit more organized. Unfortunately, we are still unpacking boxes and finding places for things. Here is one more picture, which is the piano that we inherited - we love it! It is a great addition to our house and I'm hoping that I will be inspired to brush up on my piano skills. 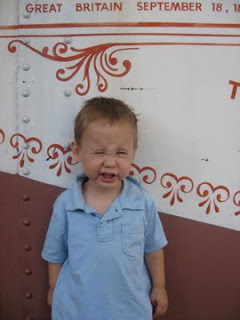 And here is what happened when we told Asher to smile...what happened?? This reminds me sooo much of Alex when he was about the same age. We're hoping he gets over it soon. Oh yes, and just to add to the overall chaos, we started potty training a couple of weeks ago. Here is a classic shot of Asher peeing on a tree. Alex still has the odd camera smile. Love those sweet faces. Miss you.